A nonprofit organization, The Family Dinner Project, promotes family meal time and says that, “most American families are starved for time to spend together, and dinner may be the only time of the day when we can reconnect, leaving behind our individual pursuits like playing video games, emailing and doing homework.” Recent studies have linked regular family dinners with many positive results that parents hope for their children including lower rates of depression, as well as higher grade-point averages and self-esteem. It turns out that children sitting down for a meal with their families is great for their brain health and development, their bodies and their spirits. You’re probably thinking, “but we’re so busy! We’re usually running past each other shoving food into our mouths before we’re onto the next thing or chasing after a little one!” We get it. We’re parents, too. 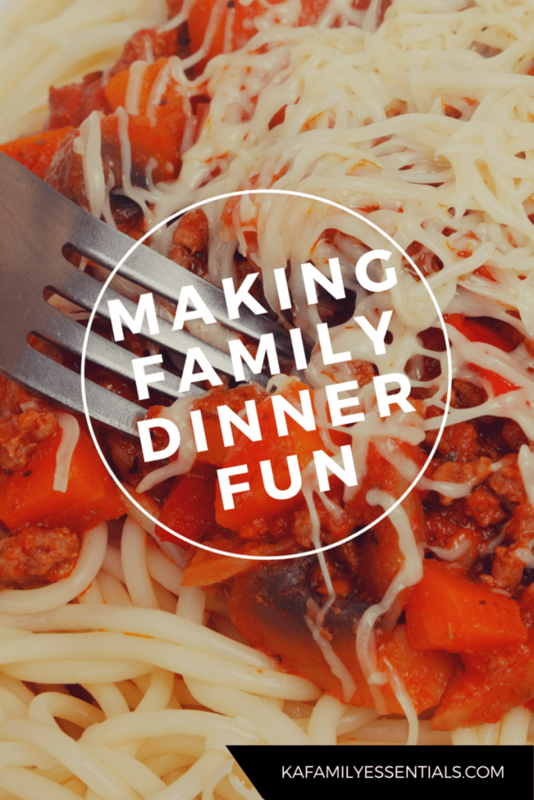 The good news is that family dinner together doesn’t have to mean spending hours preparing a gourmet meal with organic herbs. Researchers found that dinnertime conversations help boost vocabulary for young children (even more than being read aloud to!). For school-age youngsters, regular mealtime is an even more powerful predictor of high achievement scores than time spent in school, doing homework, playing sports or doing art. Adolescents who ate family meals five to seven times a week were twice as likely to get A’s in school as those who ate dinner with their families fewer than two times a week. Children who eat regular dinner with their families consume more fruits, vegetables, vitamins and nutrients, as well as fewer fried foods and soft drinks. In a survey, American teens were asked when they were most likely to talk with their parents: dinner was their top answer. One study states that kids who eat dinner with their parents experience less stress and have a better relationship with them. Wagon Wheel pasta: Try making a recipe that lets your kids play with their food (just a little!) and get creative. Wagon wheel pasta or alphabet pasts can really open your children up to using their imagination at the table and showing off what they see. Try conversation-starters: Using a game like Table Topics can help your family find questions that inspire a lot of conversation thereafter. These games can offer a fun mix of age-appropriate questions ranging from silly to thought-provoking and provides an easy way to get your family talking. Make meal prep easy: When it comes to preparing a meal for your family, don’t shoulder the responsibility all on your own. Don’t be a hero! Try a simple meal service delivery plan like Blue Apron, Hello Fresh or SunBasket to take the guesswork out of both meal planning and prep. Make it fun! Play music while you cook, dance together during meal prep – enjoy each other! Have the whole family participate in cleaning up as well so no one is left with the mess afterward.